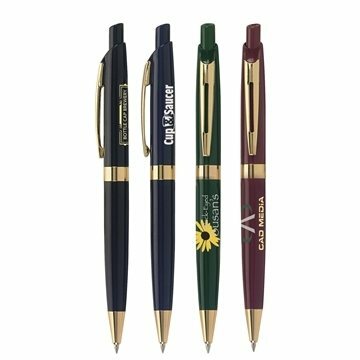 This classic writing instrument is available in a variety of colors with gold trim and sports a retractable mechanism. Ink Color/Point Style: Black ink with medium point. Great trade show give-a-way! Our prospects loved it..had numerous comments that it was the best item at the shows we did last year. Fantastic quality. Just the right size for our event. Printing was great as well. Good price and good service. It was more than reasonably priced allowing us to get many and stay in budget. Don't have a least at this time. We received the product and it was much better than expected. good looking pen, comfortable. affordable. The customer, upon receipt, was very impressed with the quality of the print and product.